Easy bicycle riding tour great for families and those who want to have a fun ride. Start in the clouds above Lake Atitlan, and coast downhill through Mayan villages, coffee fincas, and farmlands. A Picturesque 98% downhill Jaunt from Las Cruces to Panajachel. Easy. Paved. About 2 hours ride time, plus prep and van ride up. Adventure for recreational riders that provides breath-taking views of the area. About 2 hours total ride time. Start the tour in Panajachel where you meet your guide and get geared up for the ride. After you get sized up for the bike and helmet you will get a orientation talk. You will begin your bicycle adventure at the market in Panajachel where the bicycles will be tied down on top of a van. 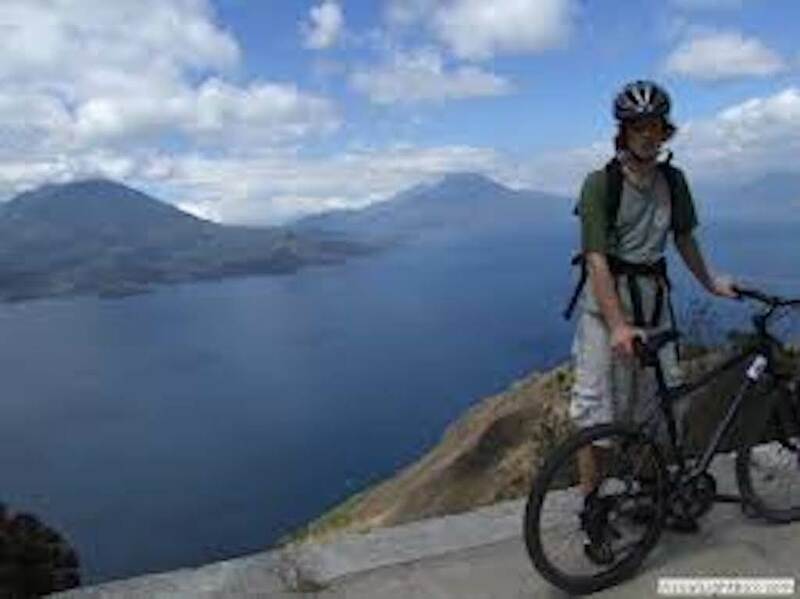 With Guatemalan locals and your guide, you’ll ride the van up 3000 vertical feet above Lake Atitlan (about 25 minutes) where you’ll disembark with your bicycles. At Las Cruces you’ll ride on a quiet, rural road where you will see the landscapes of the mountains between Atitlan and Antigua. After cycling through farmlands and a small pueblo, you’ll find yourself on a quiet road that opens up above Lake Atitlan providing spectacular view of the whole lake on high. You will see volcanoes San Pedro, Atitlan and Toliman from a side view where each’s distinctive peaks are quite pronounced. There are several miradores “scenic overlooks” for you to stop your bicycle to soak in the views and buy a bracelet or scarf if you are so inclined. After several kilometers of amazing lake views, the road leaves the lake side and enters the small village of San Andres Semetabaj. Here there will be more traffic on the road and the descent becomes more pronounced. You’ll slow down your riding and enjoy the twists and turns of the descent as you ride by various housing communities, aldeas, and fincas before returning to the market from where originally you had caught the minivan in Panajachel. Off road single track options are available as well. $80.00 per person with guide, Panajachel start and finish. If you are traveling from Antigua to Lake Atitlan, we can meet you 2/3 into the drive. You will depart the shuttle, mount your bike, and ride into the Lake Atitlan basin to meet up with your luggage. We take care of the details, you have all the fun!! Add $15 per person for shuttle from Antigua, add $10 for bike transport from Pana to shuttle meeting location. Easy bicycle riding tour great for families and those who want to have a fun ride.